The [partially] recently refurbished Pierre & Vacances L'Ours Blanc residence is located in the very heart of the resort. 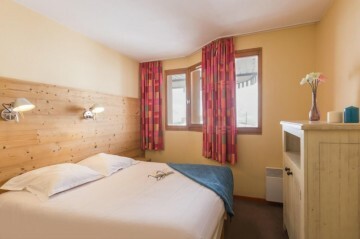 A beautiful wood-decorated building with superb views over the valley of the Massif de l'Oisans. It benefits from direct access to the ski lifts and the Olympic skating rink via a shopping arcade with bars and restaurants. For your leisure and wellness, the resort offers a large range of activities: In addition to the discovery of panoramas, sightseeing and the excitement afforded by the numerous sports and entertainment facilities of the resort, there's a whole range of activities available around the residence. A partially-renovated and "in the heart of the resort" residence. Grandes Rousses area: sunny and with 248 km of slopes!